Mastercool introduces the most advanced and user friendly Digital Manifold on the Market today! 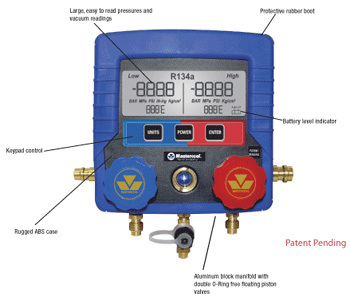 This manifold offers a large easy to read LCD that displays pressure and vacuum readings for R134a. Easily allows the technician to distinguish pressure and vacuum readings and perform systems leak check at the conclusion of the evacuation process. To insure lasting performance and durability the manifold case is constructed of ABS material and protected by a rugged rubber boot. The technician now has a fully functional manifold with the intelligence to quickly access and deliver the accurate information needed to do the job right! 99872 Complete Kit in a blow molded case includes: manifold with a set of 3-72” hoses and a set of manual couplers (82834 & 82934). • Response Time: 250 mSec.